His road to the Derby started off well enough, but it’s had an odd look to it recently. It’s like watching a marathon runner approaching the finish line in good shape and right on time, but he’s doing somersaults and pirouettes. He’s getting the job done, but not doing it in the conventional manner. We all know that he’s done a bit of meandering in the stretch since his Norfolk win, due in my opinion to the use of the whip. But I can do is trust Rosario, one of the best riders in the country, to give him a good ride in the Derby. He’s also had an unexpected late equipment change, getting blinkers off in his final prep, something you rarely or never see a Derby winner do. And he did it after a victory no less, which makes it even more unusual. Then he worked with cheater blinkers, and it started to look like an inspired move, with the idea being to prevent him from getting too sharp in the Santa Anita Derby and possibly peaking a race too early, and then returning to the blinkers for the Derby. He had earned a huge “0” Thoro-Graph figure in the San Felipe, then bounced to a “4” with the blinkers off. That’s a pretty significant bounce, but after running such a big number in the San Felipe, the SA Derby became more of a bridge to the Ky. Derby, and all you wanted him to do was get across it. As it turns out he’ll be racing without blinkers again in the Derby, which leads me to believe Harrington is now concentrating more on the 1 ¼ miles and possibly passing horses a little quicker. He was farther back last time than he’s ever been, made a quicker move than he’s ever made, and in general ran more like a Derby horse than he did in his previous races. So, although this isn’t your typical way of training up to the Derby, Harrington appears to have a master plan and isn’t afraid to step out of the box. Then again, it’s quite possible I have no idea what I’m talking about. In a year like this, especially, who can pinpoint just why you have a horse ranked where he is? The only thing consistent about the decision-making is confusion. I understand the reasons to like this colt and understand the reasons not to like him. Yes, the dirt is still a question mark, in spite of how he trains over it. The fact is, he’s winless over it. You can look at the Breeders’ Cup Juvenile as a “glass is half full” performance or a “glass is half empty” performance. I just happen to like everything about this horse, and have since last fall, and feel his BC Juvenile provided sufficient enough evidence to conclude that he likes the dirt just fine. His half-brother was a synthetic horse at 2, but won the Kentucky Derby, so I’m not going to concern myself with that. I think he’s the most explosive closer in the field and is athletic enough to overcome most traffic problems. I also can’t help but feel Dale Romans is sitting on a Derby victory. Yes, it would have been ideal to see him have another dirt race just to get a better gauge as to how well he handles it, but Churchill has been very kind to grass/synthetic horses, and it certainly didn’t prevent horses like Animal Kingdom and Paddy O’Prado from running big in the Derby. I had an epiphany. If the Derby gods are going to be smiling down on anyone, it’s the Union Rags--Phyllis Wyeth story, which is movie script material and the subject of an outstanding online documentary that made the Derby result seem crystal clear. Any doubts were removed following Union Rags’ workout Friday. I’ve been saying all along that I believe Matz left gallons of fuel in the tank going into the Florida Derby and that the colt was not even close to being wound tight for the race, coming off only three very slow breezes following an easy score in the Fountain of Youth. Since then he’s had half-mile works in :48 2/5 and most recently :47 2/5, with a final eighth in :11 3/5, out another eighth in :12 3/5, pulling up 6f in 1:15. Between his strong gallop to the pole, the work itself, and the strong gallop-out, he was motoring at a fast clip for a mile and a quarter. I had hoped to see him turn in faster, more serious works after the Florida Derby and he’s doing just that. He’ll have a stronger work next week and that should have him peaking on Derby Day. His Beyers have been stuck in the mid-90s, but I believe that’s due to the fact that since the Champagne he’s had an extremely wide trip in the BC Juvenile, drifting out badly at a crucial point in the stretch; a ridiculously easy victory in the Fountain of Youth; and a troubled trip in the Florida Derby, in which he was stuck in traffic most of the way and only was able to run full out for the final three-sixteenths. So he really hasn’t had an opportunity to post a big speed figure. It sounds like I’m describing my No. 1 horse, and I was very tempted to move him up to the top, but couldn’t get my feet out of the quicksand. Maybe that will change in the next two weeks. He regressed almost 2 points on Thoro-Graph in the Santa Anita Derby, but with an 8-week layoff between races, it’s hard to call it a bounce. There’s no reason why he won’t improve and run another big number in the Derby, as he did in the Lewis. As I’ve been saying, I don’t think we’ve seen the best of this horse. If there is any question mark it’s whether or not he has enough of a foundation under him. Fortunately, his stretch duel with Creative Cause helped in that regard and got him battle-tested. As for his modest 94 Beyer figure, I don’t think anyone questions his and Creative Cause’s speed. And it is my opinion that California tends to get lower Beyers anyway. I’ll Have Another made a big jump to run a 96 in the Lewis in his first start in five months. It’s hard to believe he doesn’t have a faster number than that in him with the Santa Anita Derby under his belt. His main strength is his tactical speed and ability to carry it a long way. Following his pattern of long works, O’Neill breezed him 6 furlongs in 1:13 3/5 at Hollywood and will ship to Churchill on April 28 with Creative Cause, so both should have their final work at Churchill. This may sound insignificant, but the fact is that 18 of the last 20 Derby winners had at least one work over the track. That is not a coincidence. Like the majority of Baffert’s Derby horses, he’ll have two works at Churchill Downs, and I wouldn’t expect we’ll be seeing any blazing drills, coming off that monster performance at Oaklawn Park. Despite his speed and the fact that he won the Arkansas Derby on the front end, he has the ability to settle on or just off the lead, and we could very well be seeing a cat and mouse game between him and Hansen, as they likely will be sitting behind the sprinter Trinniberg. His main strength is his ability to maintain a brisk pace early and still come home fast, which makes him all the more dangerous. He’s the only Derby horse to have earned a negative Thoro-Graph number, so you always have to be wary of the bounce if you use that tool, especially with him being so lightly raced. But unlike most lightly raced horses with no 2-year-old races, he had nearly 30 works before his first start, so it’s not like there’s no foundation at all. He is a lot fitter than one would think for a horse with only four career starts. Baffert said he was just immature and he didn’t want to run him at Del Mar, so he gave him time, and he’s really matured over the last three months. And remember, he has a pedigree that is geared toward stamina, so all in all, he’s quite an interesting and lively package. Drilled five furlongs in 1:00 4/5 in company at Palm Meadows, where Pletcher has the place almost all to himself. You can put him at No. 1 or No. 6, there is so little separating each horse. I just can’t displace the others I’ve already had ahead of him. His Thoro-Graph pattern is strong and he probably still has more improvement in him. If there is a question surrounding him it’s whether or not he got enough out of his two races this year. He had to dig in to defeat Alpha in the Wood Memorial, which he needed, but he did loaf a bit in the stretch, throwing his ears around. And his first start was pretty much a stroll in the park in a small field. Even though he’s 2-for-2 at Churchill Downs it still would have been nice to see him work over the track. But he doesn’t ship in until the Tuesday of Derby week. As I said last week, he was my main overlay bet, and I was starting to get a good feeling about him. But his schedule has been altered a bit too much because of an infection to his leg to feel as confident as I did before. He was scheduled to van to Kentucky the Monday after the Wood and have two works at Churchill Downs – loved it. But because of the infection, he now will have only one work at Belmont and fly to Kentucky on Monday of Derby week. That is a major change in plans, with the bottom line being he’s going to have only one work in four weeks, and it’s not going to be at Churchill. Remember that stat I mentioned above. On top of that, McLaughlin was quoted as saying “He’s not out of the woods yet.” And at this time he still doesn’t have a jockey. Ramon Dominguez, who is winless since returning from injury, no doubt is waiting to see what happens with Alpha before committing to him or Hansen. Dr. Hansen believes he’s going to stick with his horse. Alpha supposedly is doing fine and is looking forward to getting back to serious training. If this colt can pull off the Derby, he most certainly will have earned it, with all the uncertainties, setbacks, and changes in plans over the past few months. I still think he can be a major factor if things start going right for him. The addition of Trinniberg to the Derby field should actually help him, as it should force him to take back and try to settle off the pace. The Blue Grass, while an excellent effort, was not the kind of prep you want to see right before the Derby. 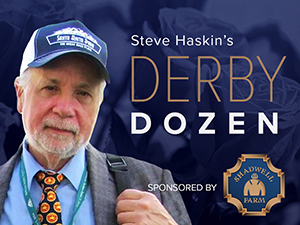 It was fine for a race like the Haskell, but it is imperative that this colt settles in the Derby, preferably off the pace, as so few horses have won the Derby on the front end. And the ones who have, established a clear lead throughout the race, and in most cases there wasn’t a lot of other speed in there. If he establishes a clear lead with Trinniberg and Bodemeister and a few others in there, it means he’s going too fast. He still has to be regarded as a leading contender because of his exceptional brilliance and natural ability. I just wish the Blue Grass had provided a better learning experience for him and got him in the habit of taking back naturally. I feel he has the temperament to rate off the pace with no problem, but horses are creatures of habit, and the more times he goes to the front, the more he’s going to think that’s where he’s supposed to be. Everyone seems to be lumping him in with the possible pace horses in the Derby, as if that has been his m.o. throughout his career. The Florida Derby was the first time he’s ever been anywhere near the lead except for his career debut. He set the pace at Gulfstream because it was handed to him on the proverbial silver platter, and he certainly made the most of it. This is a sneaky horse who is going to go off at much higher odds than he should. His speed figures are nothing to rave about, but like a few of the others, I don’t believe we’ve anything close to his best. We do know he has an explosive move on the turn, as evidenced by his first start of the year against El Padrino and his Arlington-Washington Futurity. He ran a sneaky-good race in the BC Juvenile, and with his pedigree, has developed into a much better horse. He is another I wish would have had his final work at Churchill, but he at least had a bullet work over the track before last year’s Breeders’ Cup. I’d be surprised if he doesn’t make a big threatening move on the turn from at least a half-dozen lengths back. It’s just a question whether he’s good enough. But he will make his presence felt. I’m surprised at the number of people who simply don’t like this horse and never have, even when he was ranked in the top 3 by most of the experts. I believe the reason is that he’s not flashy and doesn’t blow you away with his brilliance. He is perceived as one of those unexciting, one-paced horses who just grinds his way to the finish, doing only what he has to to get the job done. But the truth is, he is one of only two horses, along with Bodemeister, to have run a triple-digit Beyer and followed it up with a figure of as high as 98. That alone makes him a legitimately fast horse. Whatever excuse or excuses you want to give him for his Florida Derby effort, he did run the exact same Thoro-Graph number he did in his first two starts; a number that despite his “dull” performance, was faster than Take Charge Indy’s and Union Rags.’ As for individual races, only Bodemeister, Creative Cause, Hansen, and I’ll Have Another have run faster, and the last three (Bodemeister’s was in his last start) all regressed off those efforts. He has run fast three times in a row and hasn’t regressed yet; not even a quarter of a point. And that’s with one of those races being the worst performance of his career. And if the track should come up sloppy, he broke his maiden by 12 ¾ lengths in a quagmire and blew right by Take Charge Indy on a “good” track at Gulfstream. Perhaps this horse has a better shot than people think. He’s another I’d love to have higher, and he just may start climbing as the race gets closer. I cannot recall any year when a horse like this was No. 11. You just don’t know what to do with these live price horses. If you’re not content with single-digit odds, then the bottom half of this list is the way to go. It’s like buying all of Book 2 at Keeneland and stacking them up two years later against Book 1. If this horse is a big price on Derby Day I will certainly be putting a few bucks on him. But there has been a buzz around him; at least there was before all the formful grade I preps. Now I’m not so sure he won’t be a good price. He has improved dramatically this year, but in lesser races, and he hasn’t beaten anything of note. And he’ll be coming into the Derby off a six-week layoff and only two starts this year. With that said, he’s been at Churchill for a while and is training brilliantly with three works already, and has more bottom than anyone in the race, with eight races at a mile or longer. And if you want to go back far enough he did finish four lengths ahead of Dullahan in a 5 ½-furlong maiden race on the dirt at Churchill Downs, for whatever that’s worth. It’s so close for the final three spots, and it’s tough leaving Sabercat, one of my early picks, off the list. But I just feel Went the Day Well is a bit more win-ready, following a similar path as American Kingdom. He is on a good pattern, speed-wise, making a good jump forward in the Spiral Stakes and is going into the Derby off the same six weeks as Animal Kingdom. I don’t like that long a layoff, but you can’t argue with what worked for Team Valor last year. I also like the fact that this colt has a European training and racing foundation under him, running in 11- and 14-horse fields, carrying 126 and 129 pounds, and finishing close seconds at one-mile and a mile and 70-yards. And he has the pedigree to go long and a very smooth and efficient stride. So, all in all, he’s pretty solid for a longshot, and he has the potent John Velazquez – Graham Motion team going for him. Not bad for No. 12.